As every good hunter or fisherman knows, the right bait can be crucial to landing a catch. In the 1955 Hitchcock film To Catch a Thief, Grace Kelly suspects Cary Grant of being a not-quite-reformed jewel thief masquerading as an Oregon businessman -- and baits her trap accordingly. When Grant reveals his true identity by identifying Kelly's stunning "diamond" necklace as a fake, the victorious huntress leans forward and breathes, "Well, I'm not." Fireworks ensue. Literally. Diamonds may be some girls' best friend, but for the future Princess Grace, rhinestones did the job just fine. One can only imagine how well she'd have managed with access to a ready supply of the new "manufactured" diamonds -- or whatever they'll ultimately be called in the marketplace. In today's art world, where investing in old masters can lead to ruin, is it any wonder that a French street artist would have a series of solo shows -- and be represented by a gallery besides? As Kultureflash inquired during a recent London exhibition, "Vandalism or art? Activism or commercialism? You decide." One thing's for sure: The employees of Chanel -- and Nike, and Apple, and McDonald's -- assigned to clean up after ZEVS have quite a bit of work ahead of them. As does his legal counsel, for that matter. Et tu, WWD? On yesterday's cover, the industry paper featured a model wearing a dejected expression and red-soled shoes. Why so down? 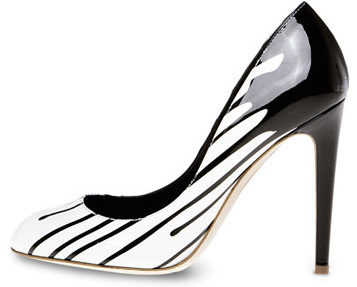 Perhaps because her ostrich slingbacks were not the work of shoe guru Christian Louboutin, with his trademarked red soles, but of Cesare Paciotti instead. The featured style does not yet appear to be available online, but several other Cesare Paciotti styles available at Zappos.com also share the red sole -- together with the signature CP dagger. Despite being armed with both a knife and stiletto heels, ignoring Louboutin's trademark may place this Caesar on dangerous legal ground. Easter Monday. The eggs have been hunted, the lamb roasted, and the heads bitten off chocolate bunnies everywhere. Those most fanciful of couture confections, Easter bonnets, have been taken off parade and stored in hatboxes until next year. 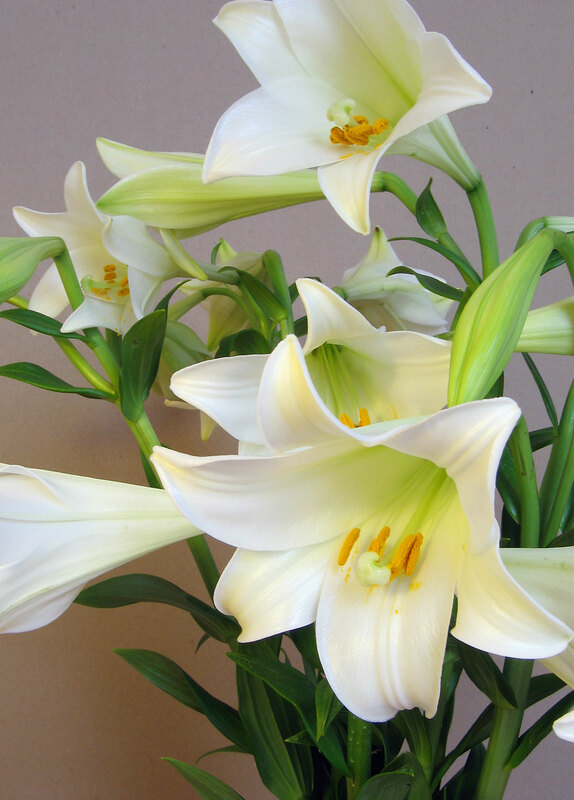 And while the lilies still decorating many churches "toil not, neither do they spin," the rest of us have to get back to work. As Jeff notes, the public response of Forever 21 to various legal charges appears to be an evasion of responsibility. Copyright infringement is said to be under the purview of the company's fabric vendors; sweashop labor violations are ostensibly the business of the company's suppliers. Privately, however, Forever 21 has settled at least some of these lawsuits. "And why take ye thought for rainment?" Perhaps because, with a few cut corners, it pays so well -- despite the legal fees. Harper's bazaar: Are fashion magazines to blame for fakes? Butterfly kiss-off: Does Zova women's fashion infringe on Zovo Lingerie? 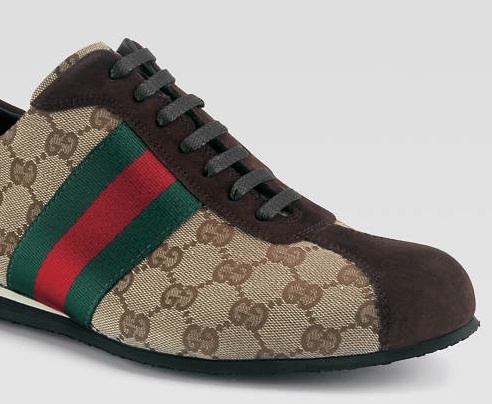 Fake Burberry shoes in the "fashion crime of the century"
He built it, and they came. 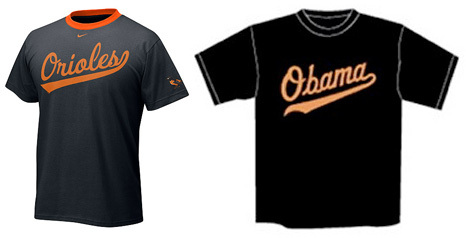 Now the Obama supporter who developed a line of t-shirts based on baseball team logos has been forced to dismantle his website, ObamaofDreams.com, at the objection of Major League Baseball. While typefaces themselves are not protected by copyright, their use is frequently an essential trademark element. MLB apparently claimed that Morris Levin's deliberate invocation of the nation's pastime, combined with his use of copycat lettering and color combinations, constituted trademark infringement. And, as the Smoking Gun noted, even Hillary's official favorite teams -- the Yankees and the Cubs -- were Obamized. A word of advice to Levin: Consider combining a JD with that Wharton MBA you're pursuing. And don't mess with major league lawyers, unless you're looking for a bench-clearing brawl. Vaudeville comedian #1: Guess who's been shopping at Gucci? #2: I told you I didn't know! #2: Why don't you just tell me? Still wondering what all the fuss is about? Check out these pics from stylish Counterfeit Chic reader Hunner Cordell, who went looking for Gucci shoes (top) and found...well, Guess. Given that Gucci owns U.S. trademarks on both its "GG" logo in diamond configuration (reg. #3072547) and its green and red stripe (reg. 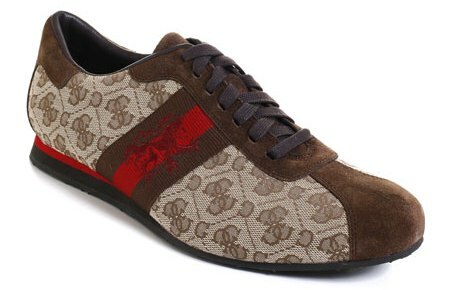 #1483526) for footwear, Guess seems to be almost taunting its higher-priced competitor. On the other hand, there are definite if subtle differences in the companies' respective Gs, the colors of the stripes, and the otherwise unprotected shoe designs. Still, if the question is whether a court would find a likelihood of confusion between the two, I'd hate to (be) Guess. If Thomas Aquinas were alive today, he'd probably have something to say about fashion and copying -- after all, he had something to say about pretty much everything else, including law. In the absence of direct revelation, Counterfeit Chic surmises that the prolific saint might have approved of CFDA Executive Director Steven Kolb's comment in today's New York Times, which appears in the context of an article by Eric Wilson about a manufacturing trade group's refusal to approve a carefully negotiated legislative compromise. Kolb noted that the path to passage of the Design Piracy Prohibition Act would now be more difficult, but added, "Either way, people who borrow from others are probably already thinking twice about it." 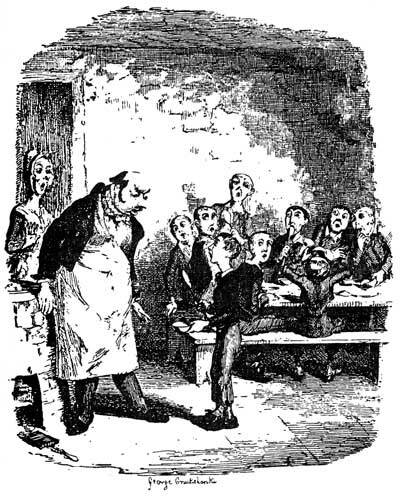 Thomas emphasized the pedagogical function of law -- while it can't directly "make men good," it can lead them to engage in good acts, which in turn predisposes them to virtue. (ST I-II, Q. 92, Art. 1.) Even a proposed law might have a similar effect if, for whatever reason, it causes copyists to think twice. And with Thomistic logic on its side, the bill still has a hope and a prayer. 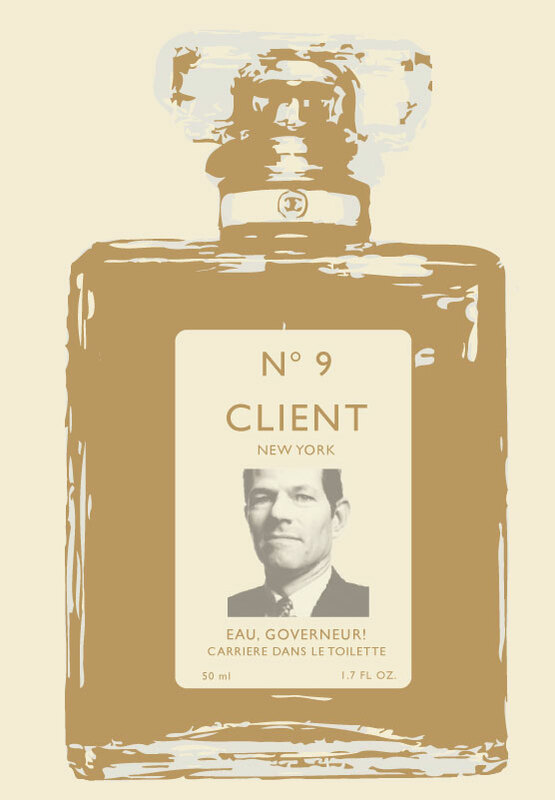 On the same day that the Catholic Church unveiled 7 new deadly sins, New York Governor Eliot Spitzer was revealed as having a bit of trouble with one of the old ones. The professional moralizer, now known as "Client 9" of a high-end prostitution ring, may not remain in elected office for long. But surely such a clever individual will land on his feet. The counterfeiting industry, for one, could use his alleged money-laundering skills -- unless cross-border trafficking is more his style. On a personal note, I only encountered Spitzer in the flesh, so to speak, on one occasion: this past Valentine's Day, when I was in Washington for a congressional hearing on intellectual property and design and he was in Washington for...well, I guess now we all know. A few of the other folks entering the Rayburn Building went over to shake hands with him, but I didn't join the queue -- good thing, too, given where those hands had just been. No wonder the governor was looking so pleased with himself at the time. Every history student, at some point along her path, encounters the idea that history may be not linear but cyclical. In its most literal and deterministic form, this theory is the stuff of late-night grad student musings over cheap wine and in practice is best left to fiction. But every now and then it really does seem that history repeats itself. This was the case today, when the board of the American Apparel and Footwear Association (AAFA) rejected a compromise text of the Design Piracy Prohibition Act that would extend U.S. legal protection to fashion designs. The vote followed months of intensive negotiations that had culminated in an agreement between the professional staffs of the AAFA and the bill's chief proponent, the Council of Fashion Designers of America (CFDA) -- an agreement that had carefully and creatively addressed all of the AAFA's concerns except the unstated one: Some big companies have grown wealthy by copying small-scale, creative designers, and they don't particularly want to stop. America has a long history of fashion piracy, dating back to the copying of textile patterns in the 19th-century (using technology originally stolen from Europe) and then ready-to-wear garments. In fact, it's not uncommon for an industry in a developing economy to emerge initially through piracy. The early American publishing industry is a perfect example, as is China today in many categories. The next step is for local creators to appear -- think of great American novelists like Mark Twain -- and for the the law to respond by protecting them. It is this step that certain members of the AAFA wish to postpone for as long as possible, as if 19th-century robber barons had taken the form of 21st-century fashion industrialists. For various cultural reasons, U.S. intellectual property law hasn't followed the standard pattern of development and embraced fashion, despite the appearance of creative American designers. It's not for lack of trying, however. Among the key proponents of protection in the past have been the Fashion Originators Guild of America in the 1920s and 1930s and the National Committee for Effective Design Legislation in the 1950s and 1960s, leading up to what became the current (and still deficient) version of the Copyright Act. Each time, the powerful retailers and manufacturers who thrived on copying opposed legislative reform -- and small designers remained vulnerable. It's no wonder that New York Fashion Week, the epicenter of creative design in the U.S., is only 10 years old. But times are changing. Fashion is having its cultural moment in the U.S. -- even the New York Times has chronicled the emergence of fashion designers as the new rock stars (and rock stars as would-be fashion designers). At the same time, many other nations -- Europe, Japan, even India -- have responded to the increased speed of information and advances in copying technology by extending legal protection to fashion design. The U.S., a fierce global proponent of intellectual property rights, can't be far behind -- especially given its renewed commitment to fighting counterfeits. 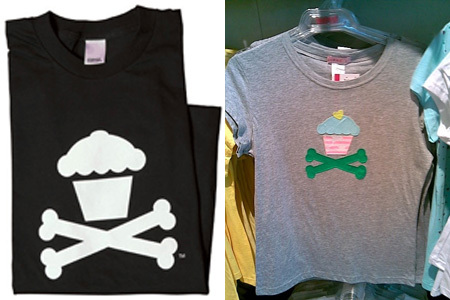 After all, every counterfeit fashion item starts as a pirated design -- there's got to be something on which to place a fake label. The AAFA has voted with the past, not the future. The Design Piracy Prohibition Act's proponents will, of course, continue to support emerging designers and to fight the wholesale copying of their work, despite the AAFA's action. The bill's journey through Congress -- it's currently still in committee, and it's a busy year -- may be a bit slower than previously hoped. Cycles of history notwithstanding, however, you can't stop progress. See Susan Scafidi, Intellectual Property and Fashion Design, in 1 Intellectual Property and Information Wealth 115 (Peter K. Yu ed., 2006). Are the small screen toils and triumphs of Project Runway's aspiring designers already fading from memory? Then check out this report on Project Lameway, a San Francisco charity event sponsored by vintage emporium Retrofit to benefit Creativity Explored. Not only did Nina, Michael, and Heidi lookalikes show up to judge the designs, but "Tim Gunn" was on hand to offer advice and encouragement. With some of the buzz around the show fading, backwards-writing contestant Elisa Jimenez mischievously noting that "runway" reversed reads a sleepy "yawnur," and even finalist Jillian Lewis telling WWD that the producers need to "change the format or something" to maintain interest, at least the parody version will offer a few surprises. As for Counterfeit Chic, it's definitely time to turn off the TV and get back to work! Mirabile dictu -- a TV show got the law right! As law students who thought their careers would play out like a television sitcom or even a John Grisham novel quickly realize, law in the world of fiction and law in the real world bear little relation to one another. After all, how easy is it to dramatize document production or the rule against perpetuities? Every now and then, however, a smart writer captures not only the spirit of the law but its letter -- as in this week's episode of Lipstick Jungle. Counterfeit Chic readers are aware that both the original novel and the TV series include a subplot in which fashion designer Victory Ford has her work copied. The small screen version reaches a climax in episode 105 when Victory sees a group of her sketches (secretly appropriated by a former assistant) already produced and displayed on mannequins in a department store window -- under the label of one Ricardo Bragini. When the distraught Victory calls on her posse for support the next morning, one blithely suggests calling a lawyer, only to be informed that U.S. copyright does not apply to fashion designs. Naturally, Victory isn't going to let a little thing like the law's refusal to stop the theft of fashion designs prevent her from confronting the guilty parties. To watch the episode in its entirety, including a dramatically ripped dress and Bragini's villainously cool response to Victory, visit the Lipstick Jungle website. Of course, the real star of the show -- the strapless, empire waist babydoll dress in question -- is probably too basic to qualify for protection even under a more advanced legal regime. But don't tell the show's stylist. A trade secret is a trade secret, after all. It's not in Counterfeit Chic's nature to agree to disagree. Being punished for "talking back" was a characteristic feature of my otherwise bookish and unrebellious childhood -- and perhaps the germ of my parents' impression that I'd be a good candidate for the lawyer in the family. 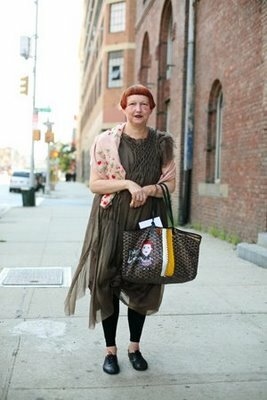 When it comes to someone as intelligent, personable, and dedicated to fashion as Village Voice columnist Lynn Yaeger, however, I may have to make a rare exception. And I certainly have to send you over to Lynn's most recent piece, for which she and I had a conversation about Oscar knockoffs. I still find it a bit odd that someone who's cultivated such an iconic personal image as Lynn -- love, love the Goyard tote customized with her portrait -- wouldn't oppose fakes. I'm also surprised that, as the fashion oracle of such a celebrated alternative, downtown media outlet, she'd endorse derivative mass production. I'd rather she inspired her readers to develop their own creativity, whatever the mainstream commercial trends might be. Lynn and I do agree on one thing, though: She'd look amazing in Tilda Swinton's flowing Lanvin on the way to the podium to accept a Pulitzer. Designer Marc Jacobs, who was recently accused of copying a Swedish scarf sold as a tourist souvenir in the 1950s, has settled the dispute for an undisclosed amount. Goran Olofsson, whose father created the original scarf, contacted the design house two weeks ago -- and notes that it "took quite a long time" to reach an agreement. Justice in Sweden must be speedy indeed. No, not a course about counterfeiting (although it was that, too). A counterfeit course. One bearing the label of an accredited institution of higher education, but allegedly without any of the usual academic input or safeguards. In other words, a scandal. Inside Higher Ed reports that Hunter College allowed the International AntiCounterfeiting Coalition (IACC) and one of its members, Coach, to sponsor a course. Unusual, but not necessarily problematic -- various private and corporate donors to academic institutions sponsor everything from annual lectures to research programs to buildings and regularly sit on the advisory boards of academic centers. In this case, however, some faculty members claim that the donor actually supplied the curriculum and that an untenured professor with no experience in the field was coerced into teaching it. Moreover, the prof has stated that he was not permitted to explore multiple sides of the issue, which would be a clear violation of academic freedom. U should google the International AntiCounterfeiting Coalition... its where I learned most of this stuff. The have pictures that show you how to tell a real from a fake. They have a bunch of other companies that have joined the cause... lol kinda ironic, but COACH is on the list too! Armed with this newfound knowledge, "Heidi" enlists friends to create a "Break the Chain" (of counterfeiting) event to raise awareness -- though she conveniently doesn't make it in person because of a family emergency. The event is nevertheless declared "awesome," and comes with its own video on YouTube. The final post on "Heidi's" blog reveals the ruse. Maybe it was effective, maybe not. But if this is representative of Hunter College's courses in marketing, the curriculum is woefully deficient in warnings about the popular response to online sock puppetry and astroturfing. Partnerships between industry and academia are common -- in the sciences, ubiquitous. But if the professors' charges are true, the IACC deserved a partner far more committed to academic integrity than to a lousy ten grand. Oh, and a note to "Heidi": Sentiment is fine, but why exactly would you offer a $500 reward for a $158 bag? For an oenophile, champagne comes only from Champagne. According last week's ECJ opinion, parmesan cheese comes only from Parma. And now kiltmaker Howie Nicholsby would like official assurance that Scottish kilts can only come from Scotland. The Edinburgh-based designer, disgusted by cheap imported kilts that he describes as like "wearing a dishcloth," has asked a member of the European Parliament to pursue protected designation of origin (PDO) status for Scottish kilts. In order to be described as Scottish, kilts would have to be hand sewn in Scotland of pure wool. While this request will no doubt cause a few chuckles -- not least because very few male IP lawyers or non-Scottish MPs would wear something so closely resembling a skirt -- it's actually part of a trend toward a more inclusive understanding of protected geographical indications, at least outside the U.S. International IP law recognizes two basic categories of GIs: (1) wine and spirits, and (2) other -- with "other" usually considered in terms of agricultural products. There's nothing in the definition of GIs, however, that prevents the protection of other things, like regional handicrafts. In fact, as I noted as part of a symposium panel organized by the Fordham Intellectual Property, Media & Entertainment Law Journal (see Summer 2007 issue), Mexico pioneered the use of GIs for manufactured products and the majority of registered GIs in India are traditional handicrafts, including many textiles. 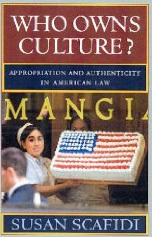 From a cultural property perspective -- one of my favorite topics, as some of you know -- Nicholsby's request raises another interesting issue. His proposed criteria, like that of other PODs or GIs, focus on kilts' place of manufacture and composition. There's nothing about historic tartans or styling; in fact, many of Nicholsby's own 21st Century Kilts are anything but traditional. There's the pinstriped group, available with matching waistcoats and jackets; the camouflage collection; and even denim and leather versions (which might not qualify as "Scottish kilts" under the proposal). In other words, Nicholsby's desire to protect a Scottish cultural product from cheap knockoffs doesn't reflect an intent to preserve some quaint Brigadoon-like past. His own collections are evidence of an understanding that styles change and culture evolves. But Nicholsby also recognizes something special about the link between kilts and Scotland that goes beyond a Mel Gibson costume drama. Oh, and as for that 1st question about a Scotsman and his kilt -- click the copyright symbol below for the uncensored answer. Thanks to Professor Beth Noveck for the tip!